evangelizing the (digital) natives : Need a EdTech Graduate Program? Go Mizzou, Go Online. Need a EdTech Graduate Program? Go Mizzou, Go Online. This reflection piece was a part of my grad school portfolio in 2011. 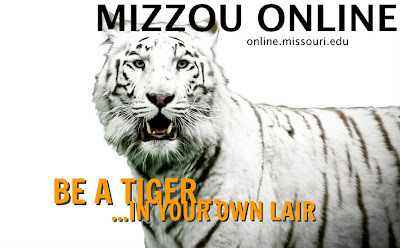 The portfolio was hosted on Mizzou Bengal servers and has since been wiped, but the knowledge lives on... this Mizzou Online program was seriously, GREAT. I entered the Educational Technology program at Mizzou with a good level of confidence in my ability to find and use technology resources for myself and my classroom, and a desire to build my leadership potential with my colleagues in integrating technology in their classrooms. Bad technology is almost worst than dust-collecting technology. I wrote this reflection in August 2010 after reading the first chapter in textbook for my first course, Intro to Technology in Schools. I’d venture to say that my predictions were largely spot-on about what I knew and did not know. As I began interacting with my classmates on the Blackboard discussion forums I found that there were many who were a little intimidated by technology and had never taken a course online, and there were still others who had designed courses online and had great experience in web design and training in the private sector. So, the former encouraged my confidence, and the latter reminded me that there was much I could learn from my classmates and this program. My best lessons learned can all be summarized in this - educational technology is about way more than flashy new gadgets or expensive computer labs. At its focus is the cornerstone of all teaching; changing the lives of our schoolchildren and growing the next generation. Educational technology is just the (powerful) tool we choose to use. The first way technology can change lives is in the way it changes how we work. Technology makes lesson planning and grading dramatically more efficient and effective for the teacher, leaving him or her more time to focus on the kids. In the teacher technical interview, I found an experience similar to mine. My interviewee knows she can plan and teach without technology, but she wouldn't want to! Technology changes her lessons through presentation (and quick retrieval) of past lessons on her SMARTboard, communication is more efficient and frequent thanks to email, and her schedule is more in order because she uses electronic calendars to keep everything together. This truth is also evident in the way classrooms can operate. Sure, teachers using right pedagogy that were already great teachers can still teach, but why would they want to stay with the "old" ways? As I showed in the intervention strategy to spice up a barren e-learning course for kids needing extra help, the web gives us many, many tools to support and differentiate for learners to develop environments best suited for their individual needs. Maturing multimedia production tools allow teachers to create their own online, digital content for students to access for their homework so teachers can give the help kids need while they are at school. Who wouldn't love to kill the "my teacher never helps me" excuse? Ironically, technology also changes our expectations for excellence. When we know (and see for ourselves that we can!) do more than just worksheets and lectures, how can anyone settle for anything less for their curricula, classrooms, and learners? But here's the caveat - excellence and optimal uses are unattainable, which is why we have to mitigate the inevitable snags through planning, research, and reflection. When I performed the concerns-based adoption model of my school network of standards-based grading, I found that almost everyone I studied was at a different level of implementation, each for their own, usually valid reason. Even the teacher who had led multiple trainings on standards-based grading was not through the stages of adoption; she was still synthesizing what she had learned with her own experiences to make the grading work for her. In Instructional Systems Design, we performed learner, task, and contextual analyses, trying to allow and adapt for every possible scenario, which was a big help in completing my Learning with the Internet project. But no matter how many variables I tried to account for in the lesson plan, my students still found new ways to foil my lesson plans. That need for constant adaption to continuously work toward addressing instructional and learning problems is the force behind action research, and the last thing I learned. If we settle consistently into patterns of just using technology for novelty's sake, then the technology begins to trump pedagogy in our instructional methods, and it actually impedes learning. Several of the studies I reviewed in my action research plan confirmed this from feedback of students during experiments. What I found as I began to implement my own research plan, was that sometimes we will continue to use technology without proven results of effectiveness, if only because we know we "should" be using it in our lessons. I learned in reflection of an adaptation of my technology integrated learning plan, that if a technology is superseding the real learning, sometimes you just have to let it go. What I’ve liked best about the Technology in Schools program is not that it fulfilled my every professional desire and dream, but that it gave me new ones. The program has built my capacity for leadership in the school beyond just technology, but in any reforms and changes we make to curriculum or procedures. Beyond knowing what the best website is for learning x, y, or z, the program has given me the confidence to evaluate resources and hardware, by broadening my frame of reference. Through discussion board forums and group projects with heterogeneous backgrounds, I have a better idea of how administrators or other teachers in the building approach the same technology purchases or integration that I had seen as a black-and-white issue. Ultimately, I hope what’s next for me is to use my new knowledge (and degree) by moving into a new role in the district of technology coach for my colleagues, and teacher-liaison to the district technology department. You've probably felt it, too, so I'm sure you know that school district budgets have gotten tighter and tighter since I wrote this originally. Thus, "new role in the district" has happened, but it has come with little extra pay, like I'd hoped. It is responsible for the iPad cart in my room, the eInstruction clickers I am currently piloting, near-monthly PD leading responsibilities in the building, and a great eval from my principal last week.